First Impression Print & Marketing : Service Center : Free Downloads For You To Enjoy! We are closed on 4th of July! 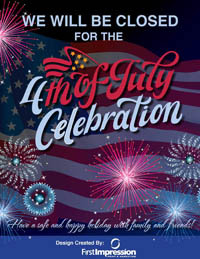 We will be closed on the 4th of July and if your business is too, feel free to download this poster (prints to 8.5 x 11) and hang it at your business so that your customers can plan around your holiday schedule. Just another way we hope to help make things easier for you! 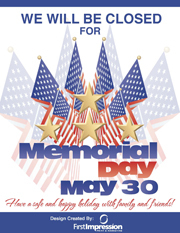 We will be closed on Memorial Day and if your business is too, feel free to download this poster (prints to 8.5 x 11) and hang it at your business so that your customers can plan around your holiday schedule.